The Chair, Birgitta Sacrédeus welcomed the participants and introduced the topic of the meeting: “Precision Medicine, HTA and Future European Scenarios”. Ms Sacrédeus highlighted that, with an ageing population and a growing number of chronic diseases, Europe needs to change its healthcare paradigm. By placing the patient at the center, personalised medicine can bring this change in all EU health systems. Moreover, the implementation of personalised medicine across the EU is strictly linked to the Health Technology Assessment (HTA) procedure, i.e. the procedure for assessing the added value of new medicines and medical devices. The Commission legislative proposal on HTA aims to harmonise the methodology and clarify the data requirements for assessment purposes. Ms Sacrédeus then gave the floor to Ms Irene Norstedt, Head of Unit, Innovative and Personalised Medicine, DG RTD, European Commission. Ms Norstedt started by underlining the exact terminology to be used when talking about this type of medicine, which is “personalised medicine”, as stated in the Council Conclusions on personalised medicine for patients of 7 December 2015 (2015/C 421/03). Personalised medicine is a very broad approach to medicine and “refers to a medical model using characterisation of individuals’ phenotypes and genotypes (e.g. molecular profiling, medical imaging, lifestyle data) for tailoring the right therapeutic strategy for the right person at the right time, and/or to determine the predisposition to disease and/or to deliver timely and targeted prevention. Personalised medicine relates to the broader concept of patient-centred care, which takes into account that, in general, healthcare systems need to better respond to patient needs”. Ms Norstedt then outlined the different activities which have been carried out at EU level in the field. More specifically, in 2013 the European Commission developed a Staff Working Document on “use of ‘-omics’ technologies in the development of personalised medicine”. In 2017 the International Consortium for Personalised Medicine (ICPerMed) was established in order to facilitate collaboration with and between EU Member States and regions in the field and to use research as a driver for personalised medicine. The group delivered an Action Plan covering actions which can be taken at regional, national, European, or even international level in the area of basic research, implementation in health care, education and training, and patient empowerment. The European Commission has also funded an ERA-NET project, where Member States and regional funding organisations can come together to co-invest in research into this area. In order to make progress in this area , throughout 2011 to 2020 the European Commission has made significant investment from both the former FP7 and the current Horizon 2020 programme. Ms Norstedt then focused on the ICPerMed initiative, explaining it is a combination of research funding organisations, Health Ministries, Science and Education Ministries, and regional authorities collaborating through research to pilot different approaches and implementation modalities of personalised medicine in health care. Ms Norstedt also informed that the first ICPerMed conference will be held in Berlin on 20-21 November 2018 and invited attendees to visit the ICPerMed website, where they can find more information on the event. Among the different initiatives carried out at EU level, the recently-published Commission communication on “Digital Transformation of Health and Care in the Digital Single Market” focuses on personalised medicine and how to better share data to progress research and advance health care. Another step forward was the signature of the 1 Million Genomes initiative. Sharing data between countries is extremely important, especially in the area of rare diseases. The European Commission is also going to organise a “Workshop on addressing needs of end users” in September 2018 in order to better understand the real needs of end users (such as hospital managers, payers, and patients) and which areas can be supported through research. The European Commission is also working on a report on EU-level actions on personalised medicine which is going to be published in autumn 2018. 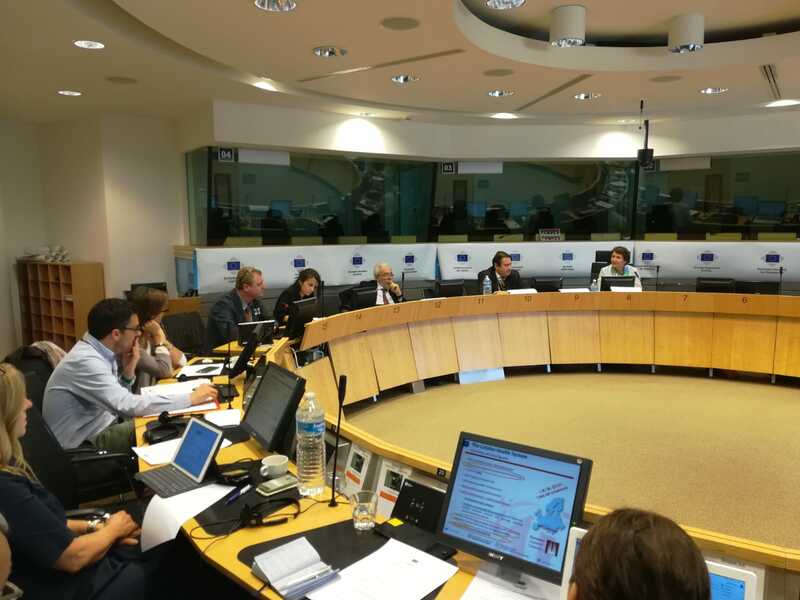 The Commission has already carried out a workshop with EU regions aimed at analising the regions’ Research & Innovation Smart Specialisation Strategies (RIS3) in order to see how many regions had included personalised medicine within their priorities. So far, 136 programmes have been analised, 50 of which have explicitly prioritized personalised medicine. The Commission is willing to further work with EU regions in order to understand how to strengthen interregional collaboration in the field. Ms Norstedt invited regions to join the ICPerMed to see what they can learn from each other and which areas would be interesting to collaborate in. Some regions are also proposing to establish a thematic partnership under the new JRC thematic platform for “Industrial Modernisation”. Among the many concrete actions undertaken at EU level, the European Commission has funded the U-PGx project aiming to show how to avoid adverse reactions to certain pharmaceuticals as well as demonstrating the cost-effectiveness and better outcomes for patients and for the health systems of avoiding additional treatment costs. Another successful EU-funded project is the IMI project EUPATI project, which aims to enhance the empowerment of patients in terms of health literacy and to better understand how patients can participate in the research and development of new treatments. Ms Norstedt pointed out that, when they seek medical care, patients sometimes know more about their illness than their doctor does. Mr Cervantes started by saying that over the recent years significant progress has been made with regards to the molecular aspect of cancer and molecular diagnosis. A biopsy is an invasive technique and not all patients are fit for this kind of test. Moreover, sometimes it can be difficult to get appropriate tissue to conduct a thorough analysis, which is often the case for patients affected by lung cancer. Finally, lung biopsy usually entails a 2% major complication rate and a 15% minor complication rate. In order to address all these issues, it is now possible to use a simple blood sample and do a “liquid biopsy”. The process consists in analyzing a small fraction of cell-free DNA in the patient’s blood and conducting a rather complete analysis. This can play a key role in cancer medicine in several aspects, going from early detection, to detection of recurrence, response monitoring, identification of a specific resistance mechanism to certain drugs, and development of new drugs. Mr Cervantes underlined that the concept of liquid biopsy is very broad, as the analysis can be carried out with any body fluid, not just with blood. This technique is rapidly expanding and has proven to be extremely useful because, among other advantages, it can detect failures of treatment much earlier than imaging, thus helping better adapt therapies to patients. Mr Cervantes continued by discussing the example of liquid biopsy applied to colorectal cancer. However, for some subsegments of patients, such as patients with stage II colon cancer (which is the most common stage), chemotherapy is not very effective. In this case, being able to detect micro residual disease through the presence of tumor DNA in plasma after surgery is very important in order to see whether the disease has been completely removed or not. The Spanish Ministry of Health is now exploring with a group of patients affected by colorectal cancer if it is possible to detect micro residual disease after surgery. This may also help assess the different molecular characteristics of the disease. Mr Cervantes concluded by saying that liquid biopsy is one of the tools available which make it possible to implement personalised medicine in cancer. Solid data have already been collected not only for colorectal cancer, but also for breast cancer, lung cancer, melanoma, and many other tumors. However, further research is needed in order to fully develop the technique and its implementation. Ms Cabezón Ruiz started by stating that the most pressing problem related to HTA is the access to and the quality of innovation, as well as the high level of prices in the drug system. Almost 85 to 90% of authorization lack genuine innovation. That is why better and more clinical evidence is needed to determine the efficacy and therapeutic progress of drugs. That is why, based on all these barriers and concerns, the European Parliament and the Council demanded an harmonisation of HTA in order to guarantee the quality of innovation of medicines and medical devices, the sustainability of healthcare systems, and the final access to patients. Health Technology Assessment (HTA) is an evidence-based process that allows competent authorities to determine the relative effectiveness of new or existing technologies. HTA focuses specifically on the added value of a health technology in comparison with other new or existing health technologies. It involves clinical, social, ethical and economic aspects. Up to now, Member States have been carrying out the evaluation of the technologies’ relative effectiveness prior to their introduction into the national health system based on their own methodology and criteria. With the Commission regulation proposal, the clinical evaluation will be done at European level. Internal Market AND quality of innovation AND sustainability of healthcare systems. The European Commission argues that it is necessary to improve the internal market and the industry’s predictability. It is also necessary to improve the functioning of the internal market. However, this objective should not be the only or the main justification for the proposal. It is important not to lose the opportunity for these joint evaluations to increase the quality of innovation of health technology, to address the clinical research priorities, the sustainability of health systems, and patients’ access to health technology. This must be the core of the proposal. other medical devices of interest, according to unmet medical needs, potential impact on patients, public health, or healthcare systems, significant cross-border dimension, major Union-wide added value, the available resources, and the need of increase scientific knowledge or evidence. In the case of medical devices, they are approved in terms of security and safety but not efficiency. Moreover, Member States often do not have enough evidence in order to carry out a proper assessment. That is why it is essential to adopt a centralised authorisation mechanism and to ensure there is more clinical evidence for medical devices. For this reason, Ms Cabezon Ruiz opens the scope for medical devices and reiterates the need of keeping them within the scope of the proposal. The proposal harmonises the evaluation of clinical aspects (what is called HTA CORE Model), keeping social, ethical, economic, juridical aspects and national circumstances at a Member State level. This clinical joint technological assessment is of mandatory uptake at national level. According to the proposal, Member States cannot carry out a national assessment of the same clinical criteria. Ms Cabezon Ruiz believes the assessment must be carried out in collaboration with the national health agency, which must set the procedure and methodology. Then, the European Commission must monitor and ensure its mandatory uptake. The role of the Commission must be only an administrative and a bureaucratic one. Ms Cabezon Ruiz has opened the possibility for Member States to prepare their assessments as a part of national or regional assessment procedures considering additional Member-State specific clinical and non-clinical data which were not taken into account in the joint clinical assessment and which are necessary to complete the general assessment of the health technology. One of the main concerns of the Members States is the role of the European Commission and the regulation of the whole procedure through delegated and implementing acts. Ms Cabezon has tried to find a balance among the roles of the Commission, of the Coordination Group (Member States), and of the European Parliament by deleting the delegated acts and reinforcing the possibility for the Coordination Group to decide upon some important questions. One of her concerns is the possibility that the proposal will be blocked in the Council. In order to avoid this, she has reinforced the Coordination Group’s role in order to gain the trust of Member States. The Coordination Group will establish the methodology for the joint clinical evaluation (not the European Commission), based on a minimum content that Ms Cabezon Ruiz has established in the proposal. The Coordination Group is composed by the Member States’ evaluation agencies which will carry out the joint clinical evaluation and determine the relative (comparative) effectiveness of the health technology. The Group will prepare a report that will be approved by a majority of two thirds. The Group is expected to carry out an evaluation of the technology following a high-quality methodology with the greatest scientific evidence available comparing the health technology with the treatments / reference devices. In order to make sure that the mechanism is fully independent, it must be entirely EU-funded. It is important to avoid the industry’s participation in the funding process. The European Commission may establish a fee system for health technology developers that request joint scientific consultations and joint clinical evaluations. The system will be used for research on unmet clinical priorities or medical needs. In no case, shall it be used to finance activities under the Regulation. Ms Cabezon has increased the timing to 4 years to ensure the medical devices directive will be fully working by then. Ms Cabezon has reinforced the cooperation with patients, consumers, experts, health professionals, NGOs in the field of health, technology developers and evaluators. This may result in greater evidence coming from real experience in the use of health technology and in the formulation of research priorities. However, Ms Cabezon stressed the fact that the whole procedure must remain independent and objective. Ms Cabezon Ruiz has introduced some amendments to make sure the process is objective, independent, transparent, and of high quality. Moreover, all the information and consultations during the joint evaluation and the scientific consultations will be published on the IT Platform. Access to the platform must be granted not only to the coordination group, but also to all stakeholders. It is important to make sure the procedure is as open as possible. All in all, Ms Cabezon stated that it is possible to have a European assessment mechanism, but it is essential to ensure that it will be a high-quality, transparent, and independent procedure. Consideration of draft report in the ENVI Committee: 7th June. Deadline for amendments: 13th June. Vote in the ENVI Committee: 10th or 13th September (tbc). The Chair thanked the Committee of the Regions for hosting the meeting and the speakers, as well as the participants. The next meeting of the CoR Interregional Group on Health and Well-being will take place on 5 July on the topic of “Big Data”. Further information about the meeting will be circulated soon.